This week I decided to talk about YouTube vloggers. A co-worker and I discovered we watch a few of the same ones and I have my mom hooked on one as well. In this series I’m sharing our favorites, along with some of your favorite vloggers as well. Join us – shall you? Our first vlogger is one of my favorites and my mom’s favorite. Campervan Kevin. He’s a down to earth guy who travels in a ProMaster Van with his 3 yorkies – Tucker (Tuck Tuck) Baby Mae Mae and Martini. His vlogs are of his day to day adventures and also on tips to living in the van. Check out his videos last summer and fall on his van build and the interesting solar panel install he had. Here’s a link to his latest vlog. Another awesome vlogger couple to add to your list is RV Swat. 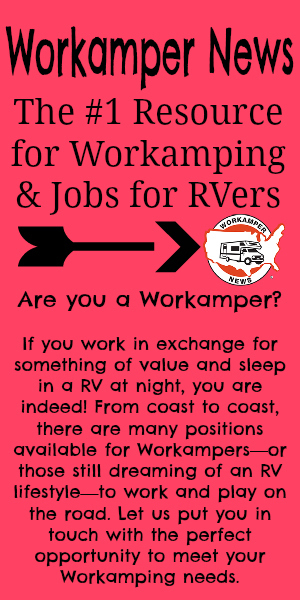 Tracy and Johnny are new to vlogging and have been reviewing Workamper News and the jobs they have gotten through us along the way. They recently hit a bump in the road and Johnny had a heart attack earlier this month. He is on the road to recovery and they will be back at it soon! Get well soon, Johnny! This video is the start of his series from when they worked the Sugar Beet Harvest this last fall. He did an awesome job on this series and it gives good info! The last one for this blog is Keep Your Day Dream. This is one a co-worker recommended and I’m excited to start watching them! They have seasons listed on their channel and it appears they were in Alaska in season 5 and are gearing up for season 6! Where to now? This video is their tear down checklist. Good info to know! I hope you enjoy this list and join us next week for part 2 of RV Vloggers! We are finishing up the best workamping job ever. We have been treated with so much caring, so much love, and so much respect that it is heart felt.We were asked to stay but couldn’t due to another commitment. We were also told that if our other commitment didn’t work out, just call and come on back . We definitely will!!!! !